You know how we're an art family...: sweet beets! After seeing this cookie recipe linked by a friend, I thought they looked too adorable not to try. I realize that beets in cookies is rather unorthodox, but I'm always up for a new recipe and placing a power-packed veggie in a cookie is a fun challenge. After all, it's not as if I'm trying to hide livermush in them! (...which I wouldn't do anyway since we're veg.) 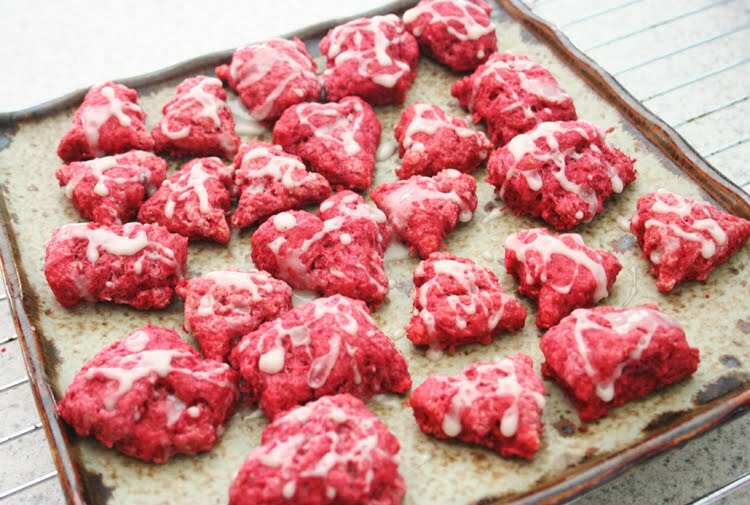 These little sweet beet cookies turned out so adorably cute in their hot pink/reddish way, which is what tipped off the kids that I may be trying to pull a fast one on them. Elizabeth: Mom! 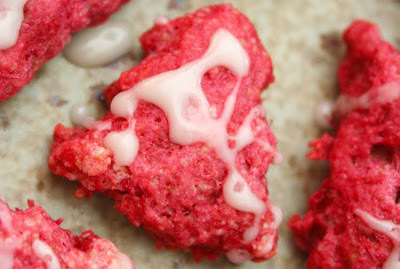 You don't use red food coloring...what did you put in those cookies?! Me: ooh, but aren't they so cute. look, I even made a heart-shaped one for you! Elizabeth: Mom! What did you put in them?! Finn: Trees?! Where are the trees? I want all the trees; can I eat all the trees; how many can I have anyway; three, mommy, I want three trees! Elizabeth: (wrinked nose) nevermind. I don't want to know what you put in them. They taste like corn. Philip: (mouth stuffed full) I want his!! So there you have it, in glorious detail. Two thumbs up, two thumbs down...which is sort of par for the course around here. Maybe I'll try again at Valentine's Day. PS. I used a little powdered sugar glaze to try to sweeten the deal. I used this basic recipe only I just made a tiny bit so I sort of guestimated the ingredient amounts. ha,ha, I love Elizabeth's reaction! We might have to try these. 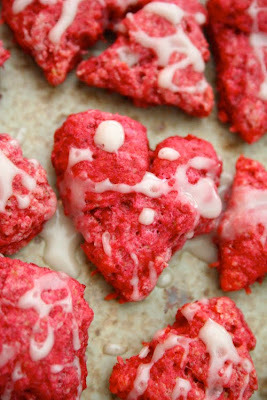 My girls would get excited that they are red (since we don't do food coloring, either). i'm scared of beets..my grandma tried to force them on us when we were really little, and I hated them! but after seeing them used for something so lovely...I am willing to give them another try; 27 odd years later!! LOL, oh this was fun to read! That is a hilarious conversation! 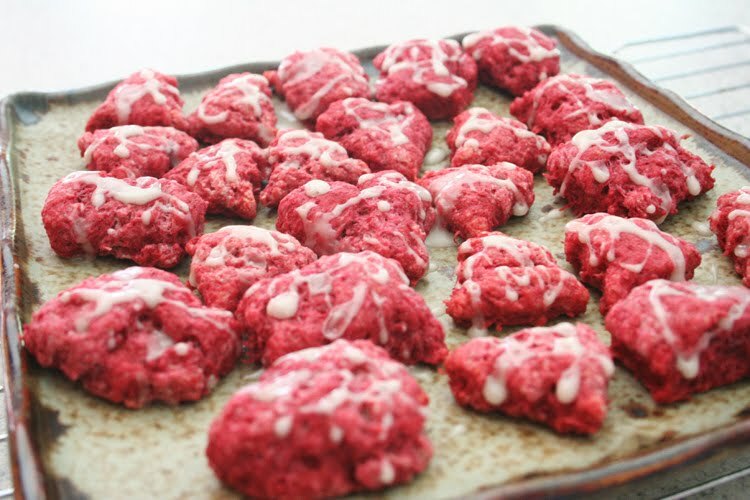 Beets in cookies, who knew? Funny! They look pretty. :) My kids never trust me when I make smoothies anymore. I've tried to sneak a few too many good things in there at times, and now they're always suspicious. These look wonderful. We'll have to try this. 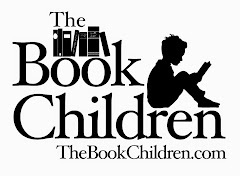 I love reading your reactions to your children's questioning. When one of mine asked if there was zucchini in the muffins, I also do the round about talk, trying to get them to just try it. What a great idea to use beets.